Today's U.L.D.B.s are commonly built of high technology materials with ballast ratios around 50% of their total weight. These long, sleek, feather weights tend to sail on their ears, making them less desirable as cruising vessels despite their other advantages. Bray Yacht Design. Web Site Snapshot: If available, above is a snapshot of the The New U.L.D.B. Sailboats web site at http://www.brayyachtdesign.bc.ca/article_uldb.html as it appeared when this site was added to the directory or last verified. 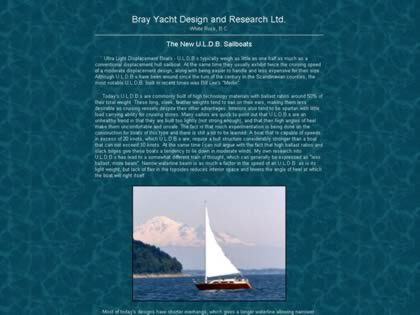 Please Note that Boat Design Net has no involvement with the above web site; all content and images depicted in the above thumbnail are the property and copyright of The New U.L.D.B. Sailboats unless otherwise noted on that site. Description: Today's U.L.D.B.s are commonly built of high technology materials with ballast ratios around 50% of their total weight. These long, sleek, feather weights tend to sail on their ears, making them less desirable as cruising vessels despite their other advantages. Bray Yacht Design.